Welcome to our Spine Page! Here you will find various information regarding your spine and different conditions that can develop over time. If you or someone you know has a condition or similar condition to what is listed below and would like more information regarding treatment options, please contact our office today (909) 989-6980. The human spine consists of 24 articulating vertebrae which create the cervical, thoracic and lumbar spines and nine vertebrae which are fused to create the sacrum and the coccyx. 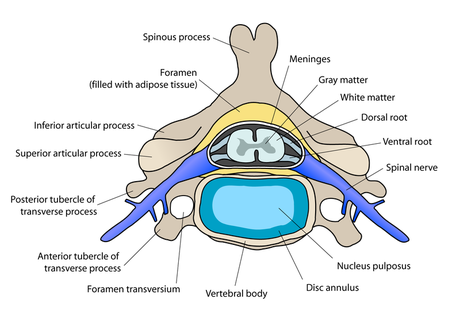 Each two vertebrae are separated by intervertebral disc composed of cartilaginous tissue. The joint formed between the two vertebrae and the intervertebral discs allow for slight movement and also help maintain the integrity of the spine. The cervical spine consists of the first 7 vertebrae and has a lordotic curve, a backward ‘C”-shape similar to the one created by the lumbar spine. The cervical spine is the most mobile portion of the spine, hence your ability to move in any direction and rotate you head. The thoracic spine is made up of the middle 12 vertebrae which connect to your ribs along the posterior aspect of your torso. The thoracic spine’s curve is kyphotic, opposite of that of the cervical and lumbar spine. This part of the spine has very narrow, thin intervertebral discs. The lowest part of your spine is called the lumbar spine. 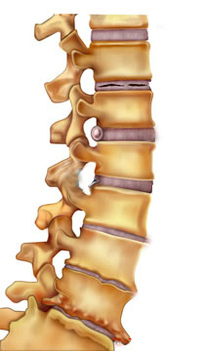 The lumbar spine has the largest of the vertebrae and intervertebral discs. It is composed of the last 5 vertebrae. The lumbar spine shape is also lordotic, similar to the cervical spine. Overall, the shape of the spine as a whole creates an “S”-shape. What nerves surround the discs in my spine? Sinuvertebral nerves are a number of small nerves that innervate the intervertebral discs. They enter the intervertebral foramen in the spine and innervate facet joints, the annulus fibrosis of the intervertebral disc and the ligaments that surround the spinal canal. These sensitive nerves fibers carry pain sensation back to the brain when there is injury to the annulus fibrosis of the intervertebral disc. How do I get spinal disc herniations? A spinal disc herniation can result from general wear and tear or certain activities that require added pressure to the spine or discs. They can also be caused through disorders of the spine that generally develop over time through the ageing process. Do I have spinal disc herniations? Intervertebral discs consist of an outer annulus fibrosis and an inner nucleus pulposus. The annulus fibrosis consists of several layers of fibrocartilage that surround the nucleus pulposus and help distribute pressure evenly across the disc. The nucleus pulposus contains loose fibers suspended in a micropreitn gel with a jelly like consistency. 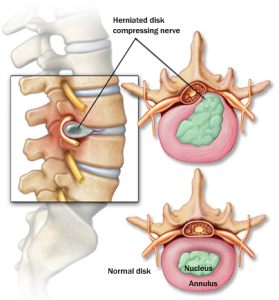 When spinal injuries occur in which there is a tear in the outer fibrous ring of an intervertebral disc, the soft jelly like central portion of the nucleus pulpsus begins to bulge out beyond the damaged rings of the annulus fibrosis. The perception of pain is then perceived through pressure created on the spinal column by the protrusion of the intervertebral disc and also through small spinal nerves that surround each one of the discs. Pain is commonly aggravated through movement and accompanied by radiating pain down the upper or lower extremities. Degenerative disc disease is a term used to describe the normal changes in the spinal disc as you age. The change in these structures most often result in some type of neck or back pain. The loss of fluid in your disc through aging reduces the ability of your discs to act as shock absorbers which makes them less flexible. The distance between the vertebrae begins to narrow and can lead to other spinal disorders over time if not treated properly. These changes can also create tiny tears in the outer layers of the discs leading to disc herniations that may cause neck and low back pain. Disc degeneration is a natural part of ageing and is not technically not considered a "disease" but a process that develops overtime from damage to the intervertebral discs. Maintaining your spines overall health is very crucial in the deceleration of spinal disc degeneration. Although the restoration of normal spine integrity will not be obtained through treatment, chiropractic manipulation will slow down the degenerative process and help restore and maintain most normal function in the spine.